I love growing pumpkins although rarely successful and this year’s crop was lamentable. About 8 small sized pumpkins was the result of immense effort with many seedlings. I like to grow giant ones and all sorts of strange shaped squashes. The dreams in March are immense but all I end up with is a few orange ones as usual. Anyway, I made this wonderful pumpkin curry. I mix and match the curry specifications with whatever comes to hand so don’t worry too much about exact measurements. I also added some leaks to the recipe below just because I had some. Careful with the chilies. I got the mixture in my mouth and eyes which is very painful especially wearing contact lens. Serve the dish with rice and drink cider or lager to take the pain away. yoghurt is good for cooling the effects of the chilly and curry. 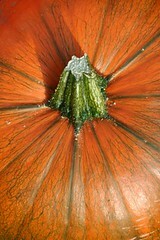 I love the colour of pumpkins and prefer cooking it as a savoury dish rather than the american way. I also don’t like the festival of haloween but it does mean you can buy very cheap pumpkins in the shops after the 1st November if your own harvest fails. Fry the onion, chilies and ginger in some oil in one pan add the spices and leave for while until the onion is soft. Put the pumpkin pieces in a bowl and cover with the curry paste. Fry in some olive oil in another pan. Add the tomatoes, chilies and stock to the onions. Add the pumkin mix and cook for about 20 minutes. Towards the end, add the banana. Serve with rice and yoghut.